Since we released the Workout Builder in late 2016, the response has been overwhelmingly positive. Coaches are using it to save time by creating customized workouts based on athletes’ individual thresholds, providing athletes with a visualization of what the workout will look like, and assisting in Planning with Training Stress Score. Athletes are using it to train with more structure and see how closely they are hitting their interval targets, thereby helping them achieve noticeable results faster than ever before. However, one thing we heard was that these workouts worked great in a controlled environment (i.e. a trainer or treadmill), but that once you took them outside more flexibility was needed. We also heard that sometimes workouts had a secondary focus and there was no way to provide that with the current system. Well, we heard you loud and clear and have been diligently working on finding solutions for your structured workout needs. Enter the new and improved Workout Builder. Anyone who has ever trained with power or pace will tell you that the numbers jump around—a lot! So, it is not a very easy task to try to hold your pace or wattage to a single watt or pace, especially when training outside with varying terrain (hello hills!). With new intensity ranges, you can now prescribe a range of intensity (85 to 95 percent of FTP; 235 to 262 watts) rather than a single target (232 watts), allowing more flexibility in how the workout is executed. Often times a workout can have a secondary focus such as spin-ups in which you are trying to increase the athlete’s ability to turn the cranks quickly or big gear intervals where the goal is to push a big gear at a relatively low cadence in order to aid in muscle fiber recruitment. 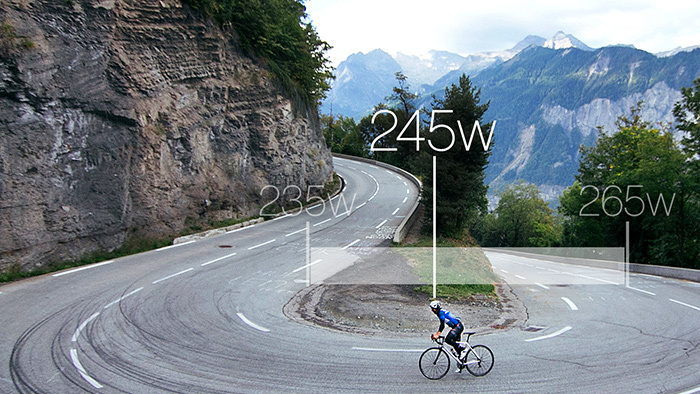 Now you can add a cadence target for running or biking in addition to the intensity target. This will allow you to put a “cap” on the intensity while providing specific instructions on the desired cadence. The real world does not always cooperate with your intended workout. Sometimes you may have to extend a warm up to account for an encountered stop light, chicken crossing, important phone call— or it may take a little longer to get to your favorite hill for those repeats. With open ended intervals you can now create intervals which will keep running until you hit the “lap” button on the device. This means that you can create a flexible warm up and the first interval will not begin until the lap button is pressed. You can also create flexible recoveries, such as “full recovery” in which the next interval should not begin until the athlete feels fully recovered. Once they are ready, they can simply hit “lap” to start their next interval. Or, rather than having a super structured interval set, perhaps you want to prescribe some fartleks in which the athlete starts and ends each interval based on how they are feeling, the terrain, or some other limitation? Now you can do that! There is no disputing that training with structure leads to results, but we understand that sometimes you need flexibility to accommodate the unforeseen, variable terrain or secondary workout focuses. With the newly improved workout builder, you can now build highly effective workouts that are also flexible enough in nature to work in all types of conditions and for all types of workout sessions.